Sphynx is a very inquisitive cat. Sphynx can be playful and naughty. Sphynx is a clever breed of cat that shows intelligent characteristics. Sphynx cats came from Toronto, Canada, after a domestic pet cat gave birth to a kitten that was hairless. Eventually the cats were taken to America, Europe and they grew in popularity. This breed of cats is the seventh most popular cat breed based on Cat Fanciers Association. What Makes Sphynx Cats So Unique? The Sphynx cat is unique because it has very little or no hair on its body. It is often referred to as the ‘feline alien’ for its strange, small face, large bat-like ears, wrinkled skin, a potbelly and almost no hair. Some types of Sphynx cats have no whiskers or eyebrows as well. The hairless appearance of this breed of cats is so unusual that people feel the need to touch the cat upon seeing it to see what it feels like to touch them. Touching the body of this cat usually feels similar to touching some warm leather. There is always a soft layer of light down found on its coat. Female Sphynx cats weigh around seven to nine pounds while the males weight around eight to nine pounds. Do Sphynx Cats Make Good Pets? Sphynx cats have a large amount of energy and love being admired. They are very friendly to all people, new and familiar. When sleeping they will usually find a warm place such as under the bedcovers or near a heater. They have voracious appetites and are known for their high metabolism. It is not uncommon for them to eat large portions of food. Sphynx cats also need care to make sure their ears do not have oil deposits. 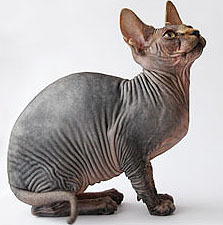 Although hairless, their dander can bring allergic reactions about in some people who are allergic to cats. Since Sphynx cat breed have no coat of fur, they need to ensure that they do not lose too much heat. As a result Sphynx cats tend to curl up under blankets and clothes, and many feline stores sell clothing meant especially to keep these cats warm and cozy. You obviously don’t need a brush to maintain these cats’ appearance, but sponging their bodies daily is recommended to keep their natural oils off your furniture. Their bodies are susceptible to sunburn, so make sure they do not go out into the sun often, or without cat-safe sunscreen.